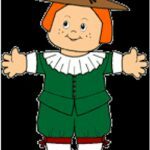 This friendly Pilgrim will welcome your guests on Thanksgiving Day. BASE: Lightly sand Renuzit® base to rough surface and paint with two coats Flesh Tone. Let dry. HAIR: Gently fluff and glue curly hair around bottom 1/2" of Renuzit® topper. HAT: For top of hat, cut a 2 1/2" circle from dark brown felt and poster board, align and glue together. Draw a 2" circle centered in the poster board circle. For tabs, cut slits to marked line 1/4" apart around outside edge of circle. Bend tabs down. Click on Printables and print out patterns.Trace and cut hat from Walnut Brown felt according to pattern. To form hat cylinder, run a line of glue along top edge, and glue to hat top over tabs, overlapping short edges approximately 1/2" at back edge. Glue overlapping edges. 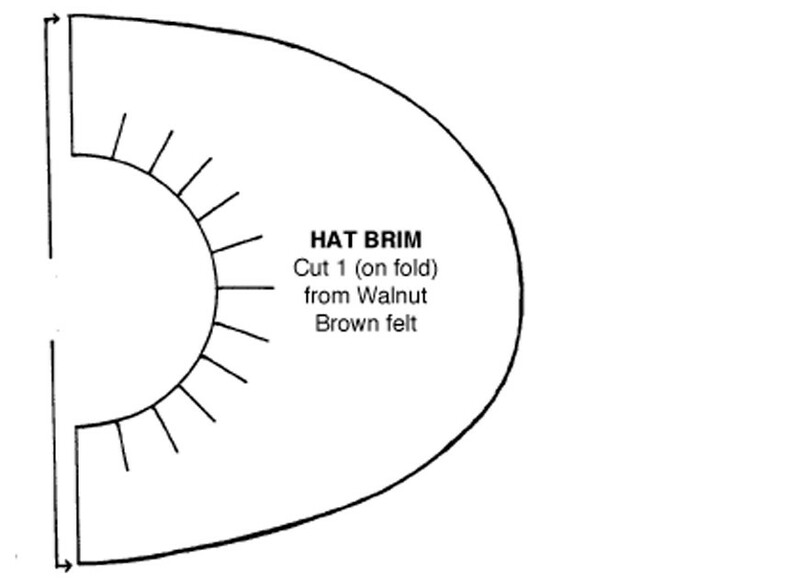 Trace hat brim from Walnut Brown felt according to pattern, and cut on solid lines. Cut slits along the inner circle of the hat brim as indicated on pattern. Slip brim onto topper over hair and glue to topper. Place hat cylinder onto topper and spot glue to brim. For hatband, trace and cut hatband from Coffee felt according to pattern. Wrap and glue around bottom of hat cylinder overlapping short edges at back. FACE: For mouth, place plastic bag over mouth pattern and trace using red dimensional paint. Let dry. For cheeks, cut two 7/8" circles from Baby Pink felt. Position and glue cheeks to base, centering on front of base, approximately 1/2" apart. Glue wiggle eyes to top of cheeks overlapping rim of base. For nose, glue pom pom to center of face just below base rim. Peel mouth from plastic and use craft glue to glue to face overlapping cheeks. For ears, cut Woodsie® circle in half with craft snip and paint Flesh Tone. (Or use 3/8" circle of beige felt cut in half.) Refer to finished photo to position and glue ears to sides of head. 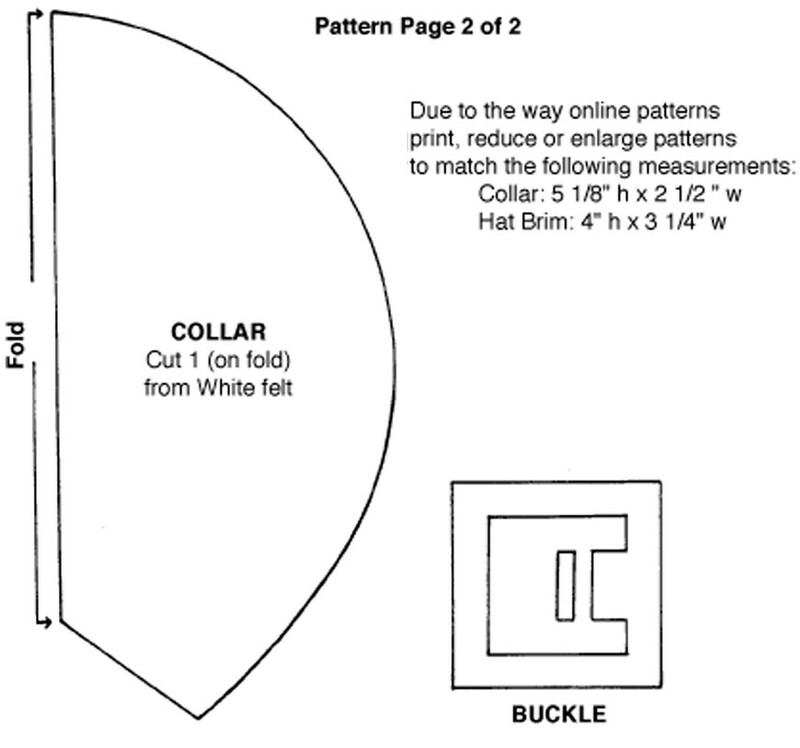 COLLAR: Trace and cut collar from White felt according to pattern. Glue bottom of base to center of collar. Tie satin ribbon into bow, trim ends, and glue to front of collar. EMBELLISHMENTS: For buckle, center and trace buckle onto Woodsie® square according to pattern. Paint center Mississippi Mud, and remainder Glorious Gold. With marker, outline along the brown center and the four edges of buckle. Glue buckle to center of hatband. This craft reprinted courtesy of Dial Corporation makers of Renuzit.